Leonard Auction remains one of the best graders on Proxibid. We’ve showcased that talent previously, as in this post, earning an A+ via PCGS-like standards. We can claim that because we have sent in raw coins that have graded the same or higher than John Leonard’s conservative grades. In this post, we we are touting how the Addison, Illinois, house deals with slabs by lower-tier holdering companies, taking several examples from Leonard’s upcoming July 20th Proxibid auction. Bottom-tier and self-slabbed coins have plagued the Proxibid portal for years now. We’ve seen bidders waste thousands of dollars on such coins, occasionally hyped by auctioneers, some who know better and some who don’t. Check out this post in Coin Update News to learn more about the problem. We’ve praised Leonard Auction before for taking the extra step and identifying bottom-tier holdered coins. Recently he has been assigning grades to them, impressing us enough to highlight his upcoming auction. The difference between an AU version of a 1921 Missouri commemorative and an MS65 version is significant, $400 for the lower grade and $2,800 for the higher one. Now imagine a Proxibidder paying $2,000, believing he got a good deal at the auction. When he sells his coin, or tries to, he gets the bad news … and likely stops collecting coins, a sad scenario we have seen too much of in our own numismatic dealings. 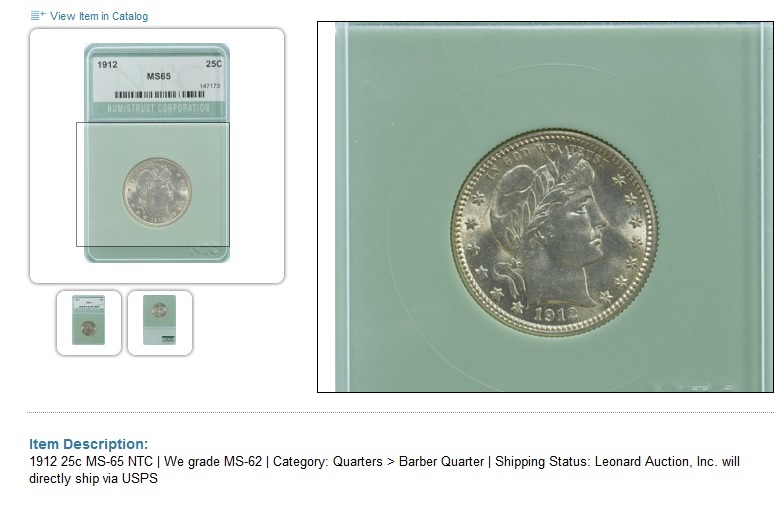 Leonard grades this Numistrust 1912 quarter dollar three points below the MS65 on the label. 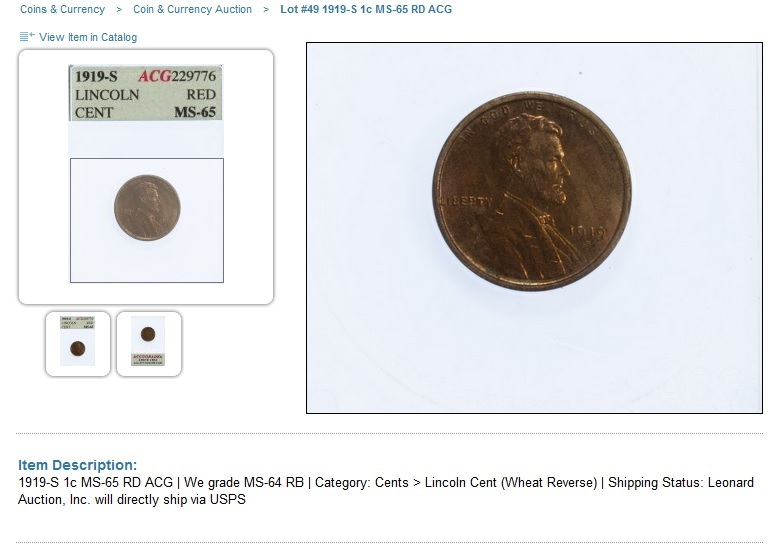 A 1912 at MS62 is worth about $300 retail. One graded MS65? $1,200. 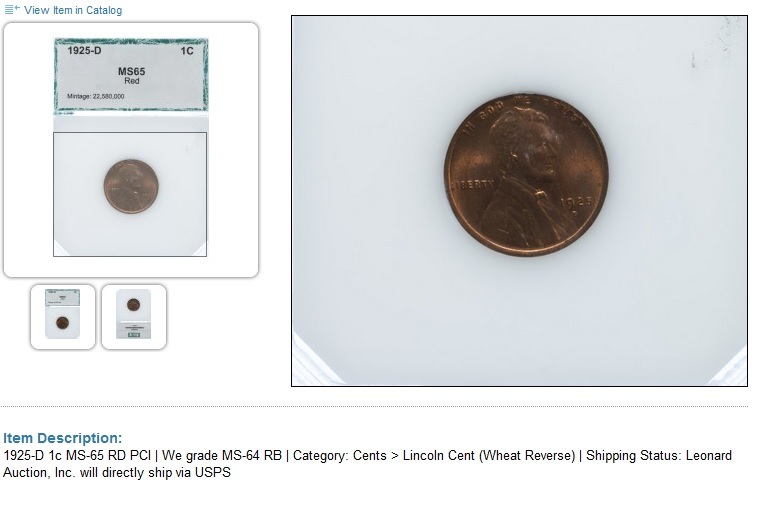 Leonard also grades coins in more respected holders, including PCI and ACG. Price difference is dramatic when condition rarity is considered, even when grades are close. He grades this 1925-D cent in a PCI holder as MS64RB (Red Brown) worth $400 retail rather than MS65R (Red) worth more than $4,500. The ACG 1919-S Red cent at MS65 is worth more than $2,600 retail by a top-grading firm like PCGS. However, an MS64RB cent is worth about $400. Once again, condition rarity is the reason, and that’s why Leonard’s grades are so important … and why we are showcasing his numismatic skills once again. 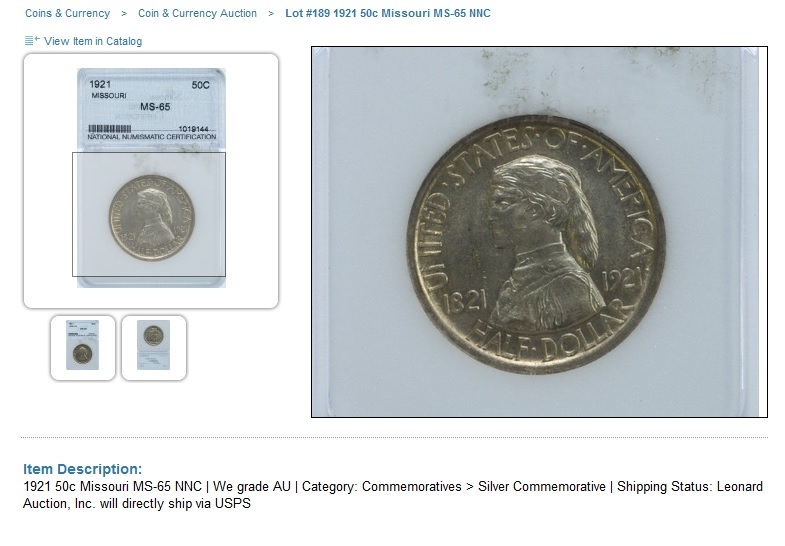 This entry was posted in Grading Auctions, News and tagged American Numismatic Association, Auctioneers, AuctionZip, Best Practices, Coin Auction, iCollector, Leonard Auction, National Auctioneer Association, Proxibid, Proxiblog. Bookmark the permalink.